A traveler at heart and a trader by education, Eduardo Pol has visited an impressive array of countries. 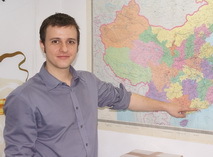 Touching down in China 2006 he's found love and job satisfaction in what he describes as a truly exciting country. 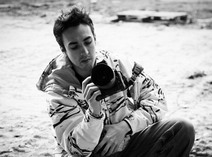 Born and raised in Barcelona, Spain, Eduardo Pol has always been passionate to see the world, and he took the opportunity whilst studying International Trade at the Pompeu Fabra University, where he spent the next four years traveling to Mexico, South America, Morocco, and England before finally returning to Barcelona. And it's just his insatiable thirst for exploring that has brought him to China. Impressed by the practical and highly efficient production environment and lured by the local cuisine, the 49-year-old says that Guangzhou will always hold a special place in his heart. Take a moment to imagine this scene. A man. A water buffalo. The man is using the beast to till the earth on a patch of farmland in Panyu District. The year? Some time around 1998 or 1999. The man is, at the same time, talking on a cell phone. An ordinary farmer? Perhaps, but unlikely. Parked nearby is a Mercedes-Benz SL500 into which the man, upon finishing his work, throws various tools and equipment before getting himself in and driving off. This was one of 's earliest memories of China and Guangzhou. He muses that the man may have been a stock trader who just enjoyed farming as a therapeutic outlet, a way to relax and connect with the land. It would certainly explain the expensive car and seems to embody the image of a quickly modernizing China that, at the same time, does not wish to forget its roots. Javier Miqueleiz, a Spanish photographer in Guangzhou, is working on his project of "111 faces in Guangzhou" which shows the portrait photos of 111 people, mostly foreigners, living in the city. Now he will share with us the project and his story. How to show a city as a whole to the rest of the world? 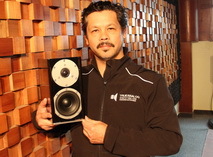 For Javier Miqueleiz, one of the best ways is through the people that are living there. That's the intention behind conducting such a photography project as "The 111 Faces in Guangzhou". With a clear goal in mind and a big ambition in heart, Lucas Loh, 30, strode out of his comfort zone as a civil servant in Singapore to pursue his career in the business which he believed would definitely take him to the global arena of business. Lucas Loh believes people's demands for real estate derive from their daily needs: offices for working, malls for shopping and houses for living. In this sense, understanding what the market needs and then working to fulfill those needs are the keys to success in this industry. Loh is the Deputy CEO of CapitaLand China, a subsidiary company of the Singaporean real estate giant CapitaLand Group. This philosophy not only works in business, but has become a way of life for the 47-year-old Singaporean. With his hunger for success, the former military man has risen from sales representative to CEO of Carlsberg China. Now, taking the helm of the world's leading brewer brand, Stephen has a new goal sight, in the biggest beer market of the world. 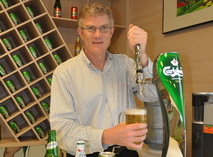 In the swanky office of Carlsberg China's headquarters, at a large meeting room with the full portfolio of products on display, Stephen Maher breezes in. He's tall, handsome, and immediately puts everyone at ease with his warm handshake. As the CEO of the Danish brewer's China company, Stephen is a man who knows that while his job is highly pressured and important, having the right attitude and treating people well is key.